Is your Facebook Page all about YOU? Sure, your fans clicked the like button on your page because they want to hear about you and your pet sitting business (or whatever your page may be about). But, if all you’re posting is about YOU! YOU! YOU!, you’re likely to bore them, train them to ignore you, or worse yet – persuade them to click that little unlike link! Seriously, when someone likes your page do you really think all they want to hear about is YOU! YOU! YOU!? They probably thought it was cool that you’re a pet sitter and wanted to interact with you and other people who like pets. They may have questions about your pet sitting business, want to get to know you a bit before they hire you to care for their pets, or may even be happy clients who want to brag about your services. But if all you’re doing is talking about yourself and/or have the page set to only show posts by you, chances are they’re not going to stick around all that long. I see quite a few pet sitters (and others) who repeatedly post about themselves or their business. It might be “I’m the best pet sitter in town” or “schedule your holiday pet sitting early,” etc. Most, if not all, of their posts are marketing and don’t encourage interaction at all. Some pages are even set up to only show their own posts – not their fans’. This sends a message to the fans of that page that what they have to say isn’t all that important. OUCH! Page owners who do this usually view their page simply as a way to advertise their services or get their message out – whatever that may be. Others are just on a learning curve and haven’t figured it out yet. The thing is, Facebook is a social website and if it’s used to be social and get to know people, it’s going to be way more effective as a marketing tool than if it’s just used to blast out a message. Think of your Facebook page as a party and the people there as your guests. If you were to have a real life party and invite the same group of people, my guess is you wouldn’t tell them all to be quiet when they walked in and then stand up and start talking about yourself. Heck no! You’d mingle, get to know as many people as possible, offer them a drink, introduce them to each other and have a great time. You’d be social! As the owner of the page on a social media website, it’s your job to be social and try to include as many people as possible. Of course, there will be some lurkers who won’t ever say a thing – that’s always going to be a fact in online communities. But, by asking questions, commenting on what people have to say, and making your fans feel valued, more people will participate. The result is that your Facebook page will become a great way for you to get to know your current and potential clients, and build some buzz about your pet sitting and dog walking services! And, by letting your fans have a voice, many of your current clients will keep that buzz going by telling others how wonderful you are with their pets! 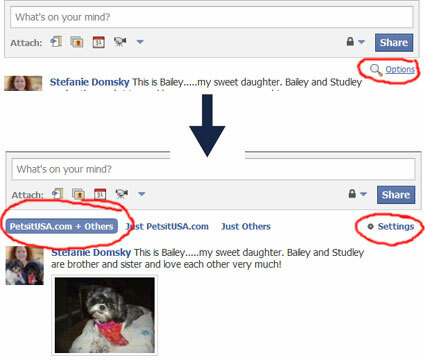 First, click the Options link under the share button. Then you’ll see the Settings, where you can choose what posts you want to be visible: Yours + others – Just Yours – Just Others. Click on Yours + Others. Now posts by you and your fans will show up on the wall.